The Advance Mills Historic District, located northeast of Charlottesville, was added to the National Register of Historic Places in April of 2002. This historic district, which was added to the Virginia Landmarks Register in June of 2000, includes the village of Advance Mills and the historic Advance Mills Bridge. Advance Mills is one of Albemarle County's most recognizable milling communities and contains resources dating back to the early 1800s. The Fray family dominated the history of the Advance Mills community. 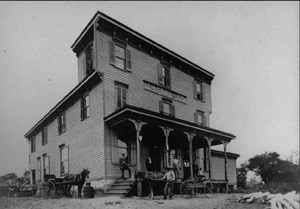 Town founder John Fray operated a flour mill at this location beginning in 1833 (CDP 2/24/1985). For more than fifty years the village was known as Fray's Mill. The name was changed to Advance Mills in 1888 by the U.S. Post Office. ↑ Web. Albemarle County Historic Resources: Registered Historic Properties, Albemarle County, retrieved 30 Dec. 2010. ↑ Web. Advance Mills History, Advance Mills Village Homeowners' Association, retrieved 30 Dec. 2010. This page was last edited on 12 December 2016, at 09:45.